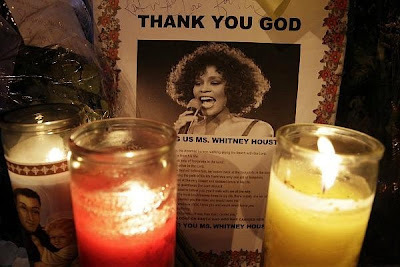 The National Enquirer has released the photo of Whitney Houston in a casket. The headline says that the diva wore her favorite purple dress, $500,000 worth of jewelry and slippers made of gold. The headline was matched with the zoomed photo of Houston. The release of the photo received backlash from Facebook and Twitter, calling it insensitive and tasteless. Reports are saying that the casket photo was sold by Bobby Brown's sister. Too bad for Whitney, people are taking advantage of her.